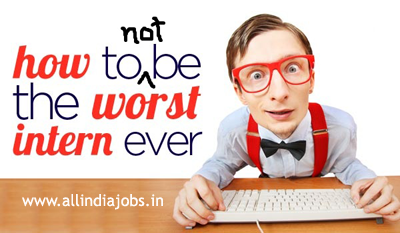 5 Tips for intern freshers to turn your internship into a job. An internship is a method of on the job training for professional careers. Internships are similar to apprenticeships for trade and vocational jobs. Interns may be college or university students, high school students, or post-graduate adults. These positions may be paid or unpaid and are usually temporary. always ask for work. Try to work hard to complete the given tasks on time. In any industry the most important thing is time. So try to complete all the deliverable on time. Start early. Be the first to reach office. Be the last to leave and meet people who have stayed in late. Join them and offer a helping hand even if it is a simple and silly work. It really help you in getting a soft corner at other employees.Your commitment and diligence will get you and your work noticed. neglect this step. it will definitely help you in long run. With this document you can explain your mentor or manager about the things that you have done as an intern. It will definitely help you in your future interviews and sometimes the same company that you are doing internship may hire you. Do not talk about or ask about money or salary when you are in internship. When you are not paid, you are fully focused on how well you are utilizing your time. However the company will pay you at any cost. Do not rush for money, instead learn the thing and get the required skills or confidence to settle in your career. Use this internship opportunity to connect with as many new people as you can inside the company such as colleagues, clients, vendors and other interns. Go out for lunch or a coffee to bond with them. Building long lasting relationships will definitely help you in your career. Every organization has a specific set of rules. Most of the companies provide you overview of the company policies at the time of joining. So must follow all the company rules such as dress code, tail gating, usage of resources, etc. Always stay away from politics and gossips. These two things will harm your career. Do not align yourself to any specific group. interact well with your colleges and superiors. Ian completed btech mechanical 2016in Hyderabad. I have 1 year experience in quality manager.in pravite company Bangalore. Any job offer in Anantapur kiya..
My name chandrasekaran my qualification b. Com (ca) I have anyone requirement ready to sencearly work.